This is book two in the Ashmole Foxe Georgian Mysteries. I didn’t read the first but didn’t have to, since this is a self-contained story. 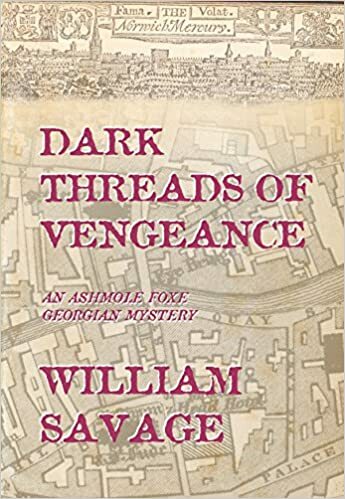 I looked forward to the read, because I have read and reviewed two other books by William Savage in the Dr. Adam Bascom Georgian Mystery series and found both of them intensely interesting from both the historical and mystery perspectives. This series is set in Norwich, England, in the 1760s. Its main character, Ashmole Foxe, is an enigma – a bookstore owner whose store in seldom open for business, and a man who dresses in a dandified fashion. He is taken by many to be somewhat of a fop, visiting the theater and prostitutes alike, but in fact is well-educated and is at ease in the company of both peers and merchants. This positions him to take on investigations that would be awkward for others. This time, the mayor of Norwich is demanding Foxe find the murderer of a prominent merchant and banker, Joseph Morrow, who body is found in the hold of a wherry, reeking of alcohol and feces. The mayor is afraid the city will be crippled by a financial panic when Morrow’s murder is revealed and sends Alderman Halloran to run interference for him with Foxe. Before Foxe can even find clues in his investigation, the Alderman demands that he drop his inquiries into the murder to solve the problem of the apparent theft of some of his favorite books. Complicating the investigation is the fact that Joseph Morrow was Bible-thumping, holier-than-thou teetotaler, who treated his servants badly and beat his wife. The number of possible murderers increases exponentially as the tale unfolds. Foxe soon realizes he has no clues and few ideas, and without his much-loved companions, the Catt sisters (two ladies of pleasure), he has lost his ability to gather information from the streets. He hires the widow of a bookstore owner, Susannah Crombie, to run his shop, and she soon has the place stocked and jumping with sales, which makes him a prosperous merchant. How can he restore his reputation for high fashion and low morals? Surprisingly, Susannah proves a bottomless source of ideas and help. Despite a riveting opening chapter, it took me a bit longer to enjoy this book, compared to the Adam Bascom mysteries. Perhaps it was because my medical background related to Bascom or the fact Foxe is not an immediately sympathetic character. However, the witty dialogue and the humor of Foxe’s appearance soon won me to him. How can one not snicker at a man dressed in a plum-colored velvet coat, matching breeches, and a pink silk waistcoat and stockings, all heavily embroidered? Foxe believes himself to be the height of fashion! As usual, the author pays incredible attention to the details of 18th century Norwich, its society and social and domestic norms. The plight of the single or widowed women, of orphans, and of unlucky servants is carefully told, and the value of the historical information counters the fact that this book is somewhat overheavy with telling. I also enjoyed the details of bookselling. In short, I recommend this book and feel certain that readers of history, mystery, and general fiction will find it engaging and enjoyable. Great review, Noelle. I love the wit and detail in William Savage’s books, and I adore Foxe! Gotta read more of them in my copious free time! Enjoyed the review, Noelle. I think the dialogue in William Savage’s novels really brings the characters to life. And I was so impressed with his research. Thanks, Judith. I follow his blog and have learned a lot about that historical period. I hadn’t read (and still haven’t unfortunately) the first one in the series. There was absolutely NO problem getting into the story and the characters.